After 8 years of home education, we have decided to partner with an excellent charter school to educate our kids this year. This new chapter in our lives is bittersweet. I will miss homeschooling, but am so excited to experience a new method of learning WITH my kids. The older two have not been in school since 2nd grade and Kinder (11th & 9th this year). The younger two have never been to school (6th & 4th). Needless to say, they are excited. 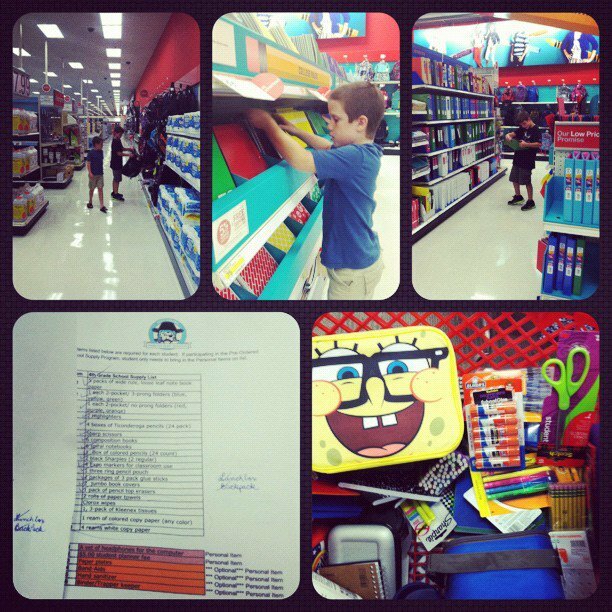 Shopping for supplies was a MONUMENTAL event. "What will you do with all that time?" you may ask. First of all, the school requires a lot of parental involvement. So, while I don't plan to live at the school, I will be doing volunteer work both on and off campus. Secondly, I'm still fulfilling the role of "Taxi Mom", now with more routes added to my schedule. My oldest will be driving next month, which will be a tremendous help. Another way I plan to fill my time is frankly, a little selfish. I want to go to the gym, do some writing, practice guitar, and take a friend out to lunch. Looking forward to a little more "me-time"; which really, is good for everyone because, "If Mama ain't happy..."
And finally, I will be working part-time in our home health care business. This summer, I've been learning how to do payroll and billing. My goal is to become the payroll/billing Master, then tackle some of our training programs, build up our web presence through our site and blog, and finally organize a marketing campaign based on providing free continuing education events for medical professionals in our community. There is much to do! I certainly won't be bored. This blog will morph along with our daily life. Expect to still see recipes, poems, and weekly family updates. The School Room will still have all of the existing education resources, but we will likely add more tips and resources for parent-teacher partnership, homework helps, etc. We are on an adventure. This blog will be our journal ~ the place where we record the triumphs and struggles of our journey. Even in the sphere of public education, we will be Adding to the Beauty. Won't you join us? My kids have been at BHCA for several years and it is truly a wonderful school. My nieces and nephew attend NBHCA and they love it there. Dr. Kitts runs a great program. I think you'll be happy with the decision. They challenge the kids (and the parents) to rise to the top. PS. It's a shame they couldn't go to the one right next to you.